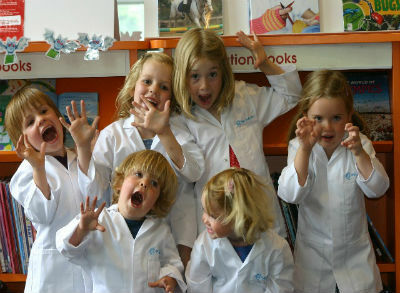 Mini Professors is a science programme that has been designed specifically for 2 to 5 year olds. We aim to make science classes fun and enjoyable for pre-school children. We hold separate sessions for 2 and 3 year olds and 3 to 5 year olds. Every class is different, with a completely new and exciting scientific topic being taught each week, so your little one (and you) can attend for 2 years and experience something new each week. We cover everything from polymers to dinosaurs, maths to tropical rainforests and much, much more. Our Mini Professors get to wear their own mini lab coats and learn about the basic principles of scientific experimentation, whilst having loads of fun and generally getting stuck in. A typical class starts with our Mini Professors 'Welcome Song', followed by an introduction to today's topic, with pictures and props, then our first experiment, where we encourage all our Mini Professors and their grownups to join in (and maybe get messy!). Next we have a short video, related to the scientific topic, then a story followed by another fantastic science experiment. At the end of the lesson we summarise what we've learnt and end with the Mini Professors 'Goodbye Son' and (very importantly! ), each child is given a sticker! Each Mini Professors session lasts 40 minutes and follows a set format so the children know what to expect next. All the activities are concise and interactive, catering for the many different learning styles and keeping the little ones’ attention! The children love to get involved in the experiments and it is a great opportunity to prepare them for preschool and school. Young children are so enthusiastic about science – they have inquisitive minds and they are not afraid to ask questions. We encourage the grownups to join in too and carry on the learning experience at home with their children. These classes are tailored for our younger Mini Professors: songs, experiments, stories, hands-on, interactive, educational and, most importantly, FUN! These classes are tailored for our older Mini Professors with more hands-on experience and scientific explanations. 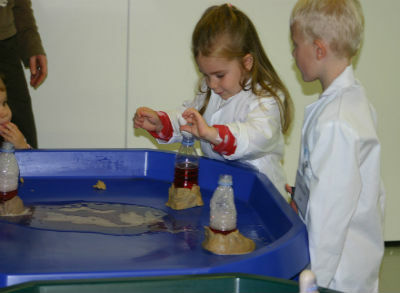 "Great fun for everyone – the children really love the experiments"
"Thanks so much my kids had fun and learnt a lot! We have been talking about your experiments and singing the songs in the week so something has gone in!! Thanks for a fun and educational few weeks." "Really pleased to find a parent and toddler class that my 3 year old enjoys and looks forward to every week." "Mini Professors is cool! Splatting the egg was the best bit!" "Mini Professors is a great introduction to the idea that ‘science is all around us’. The sessions are full of variety and Emily and Sophie are very enthusiastic ‘Professors’! The taster sessions have given my pre-schooler and me lots to talk about together." "Mini Professors has been a fun, active learning experience for my son (age 2.5yrs). He has thoroughly enjoyed every minute, and we will be back for more! The language, content and practical side has been delivered with real enthusiasm and at a perfect pace." "What a great class! I wish there had been something like this around for my older children. My 2 year old has learnt so much and I have even learnt a few things too! I would recommend this class to everyone with little ones."